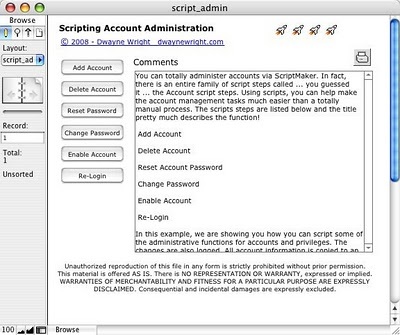 You can totally administer accounts via ScriptMaker. In fact, there is an entire family of script steps called ... you guessed it ... the Account script steps. Using scripts, you can help make the account management tasks much easier than a totally manual process. The scripts steps are listed below and the title pretty much describes the function! In this example, we are showing you how you can script some of the administrative functions for accounts and privileges. The changes are also logged. All account information is copied to an accounts table and changes are documented in a log file. Add Account - brings up a custom dialog for the account name and password you want to use. All new accounts with this script have Read Only access. 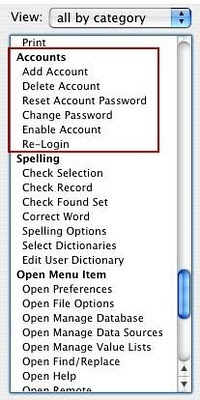 You cannot type in a privilege set you want to use, like you can with the account name and password. 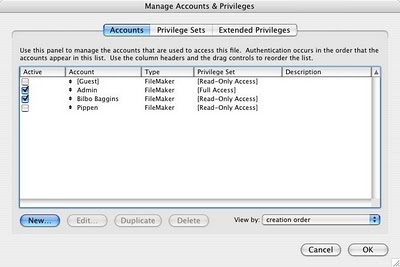 You would need to have a separate script for each account privilege set you would use. Delete Account - brings up a custom dialog for the account name you want to delete. We are using the Show Custom Dialog box script step and it does not allow for a pick list option. If you want to have this type of option, create a new layout to look like a dialog box. Reset Account - brings up a custom dialog for the account name and password you want to reset. When authenticated, it logs this information in the accounts and log tables. Change Password - brings up a dialog box that explains that this resets the current password for the current account. This isn’t so much an admin type of function. It is something that could be used on a user by user basis. Enable Account - brings up a custom dialog for the account name you want to enable. When authenticated, it logs this information in the log table. Re-Login - allows the user to log out of the database and log in under a different user name. A very nice feature when a developer is testing a database.